Strikers stay close to fires in barrels for warmth Friday morning Nov. 16, 2012, outside the Hostess Bakery in Biddeford. 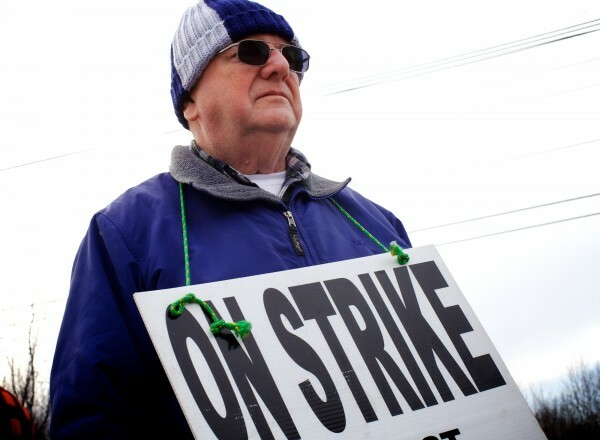 Ken Rumney of Standish stands on strike outside the Hostess Bakery in Biddeford on Friday, Nov. 16, 2012. He started working for the company in 1969. 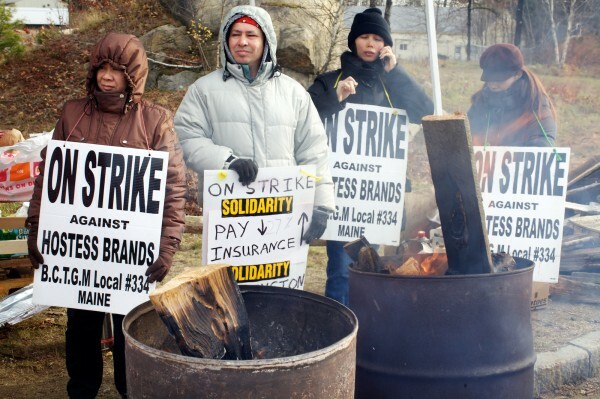 BIDDEFORD, Maine — Labor leaders in Maine say the resilience of the Hostess workers on the picket line at the company’s Biddeford plant, which is in the process of being shut down after the company on Friday said it would liquidate the business, gives them inspiration in the face of what they believe have been ongoing efforts — by politicians, including Gov. Paul LePage, and corporate investors — to reduce union influence. Bakers’ union officials and their supporters say also that the demise of Hostess Brands Inc., which failed to convince striking workers to return to their jobs, is a warning sign for corporate investors seeking to squeeze more profits out of the working class. At issue is a slate of concessions the company, best known for producing Twinkies and Wonderbread, asked of its workers — reportedly an 8 percent pay cut and changes to their pensions agreements, among other things. Hostess officials maintained that the company couldn’t stay viable without making the changes, while union leaders countered that the concessions went too far. Workers began striking last week, and the company gave them a 5 p.m. Thursday deadline to return to the job, threatening to close its 33 American plants and lay off all 18,000 of its workers if they didn’t. Members of the Bakery, Confectionery, Tobacco Workers and Grain Millers International Union refused to concede, and Friday morning, Hostess announced plans to file for bankruptcy, let go of its entire workforce and liquidate all of its assets. The union’s willingness to go down with the sinking ship — and in some cases take credit for sinking it — in the Hostess case may prove to corporate investors that the working class must be reckoned with, said University of Southern Maine economist and labor relations expert Michael Hillard. Hillard said he will be interested to see what the ripple effect of the Hostess bankruptcy will have for labor relations nationwide, as the combustion comes on the heels of scattered Republican-led efforts to weaken unions through state laws, not to mention a steady decline in leverage in the 30 years since then-President Ronald Reagan fired more than 11,000 striking air traffic controllers. In Maine, Gov. LePage and the Republican-led Legislature in 2011 proposed so-called “right-to-work” legislation that would have allowed workers to refuse to pay dues or fees for union representation at workplaces where active unions negotiated on their behalf for wages and benefits. The bill was ultimately defeated in the face of fierce opposition by labor leaders across the state, who characterized the legislation as a “union busting” measure. “You’ve seen ownership practices for any kind of large scale manufacturing operation replaced by this short term financial mentality, that’s come largely from Wall Street, and looking at companies less as enterprises than as bundles of assets that can be moved around a chessboard,” Hillard said. “They’re operating with the idea that you can always squeeze more — squeeze more out of operations, squeeze more out of labor, squeeze more out of distribution, just find any way to get more profit. “The idea that this is how you run a healthy economy is a question, and so who’s standing up to this? Labor unions are one of the ways people have to make their concerns known about the economic conditions in our world,” he continued. Bigney said that when she visited workers outside the plant holding signs in Biddeford, most cars honked and drivers waved in support, while other people stopped by to donate food or firewood for the strikers warming their hands by barrel fires. One of those people who stopped by with firewood was incoming state House Majority Leader Rep. Seth Berry, D-Bowdoinham. Biddeford Mayor Alan Casavant said, “philosophically, I think the union wins” in the Hostess standoff.